2011 was a good year. Annabel Anderson taught me how to paddle properly. I got a SUP instructor license from Peter Bartl in Austria. I got my Fanatic Fly Race 12'6', the best SUP ever. I travelled to SUP Races in Germany, Switzerland, Austria, France, Spain, Italy, Holland and the UK, killing one campervan and being robbed while asleep in the van on a French highway parking lot. I paddled 220km in Holland in the worst headwind ever and the shoulder on which I had major surgery gave me no problems at all. I started SUP-surfing on river waves. I became a Fanatic Team rider. I learned a lot, saw many amazing places, met even more amazing people, paddled on 14 of the 307 Bavarian Lakes, quite a few rivers and had a lot of fun. Here is my very personal recap of the 2011 highlights…thanks to all my SUPer friends who were part of this! The February highlight would have been the full moon paddle on the Bavarian Amazonas with Etienne (Munich Stand Up Paddling). It was cold, foggy and spooky – the whole setting very much reminded me of the True Blood opening credits. Well, the point of going for a full moon paddle is having moon light, but it was so foggy we couldn't see a thing for 2 hours. But when we finally reached Lake Starnberg, the clouds cleared and we saw a nice full moon over the lake. The full story with pics of the paddle is here. After the paddle we had a thick crust of ice on our boards and I spent the night (it was minus 9°C) in my campervan right by the water. Yes, that was cold. The park heating did not work, but I had a 500gsm sleeping bag. For me, the March highlight was a sunset paddle on mostly frozen Staffelsee in Bavaria with Carsten Kurmis and Etienne Stander. Yes, a SUP works as icebreaker too. Here's the video. And here's the full story. Before Peter Bartl starts shouting at me I need to say: Don't do what you see in the video! Don't wear snowboarding clothes when paddling in cold water, you are at serious risk of drowning in case you fall in! After the paddle we connected the lava grill to the gas tank of my campervan and had a nice winter BBQ. Then, there was another interesting paddle in March 2011. A group of undisclosed Munich Paddlers did some breaking and entering for a highly illegal paddle at the place where Ludwig II, King of Bavaria, sometimes also called "Mad King Ludwig" was born in 1864: Palace Nymphenburg. Here's the video and here's the full story. APRIL: Paddling Lech and the Austrian-Slovak boarderland. Getting a SUP Instructor Licence. The April highlight was a totally amazing 4 hour paddle on River Lech in Bavaria, with Guido Meier from Bavarianwaters and Windsurf Legend Alois Mühlegger. The turquoise water, the dark green trees and the sandy beaches were absolutely stunning. April was also about the time where all the crazy road tripping started. The first trip was to my dear old friend Peter Bartl (paddelsurfen.at) in Austria. I have known Peter from Riversurfing on Eisbach, Inn and Mur for over 10 years, and he is the Austrian SUP Pioneer. He founded the first German speaking SUP Instructor course (asupa.at license, which is now ISA accredited). So that's why I drove to the Austrian-Slovak boarder, to get my SUP Instructor Licence. Paddling on Röcksee and Mur in the borderland was amazing, the scenery is beautiful and at night we saw millions of stars. Oh, and smoking in restaurants is legal there. 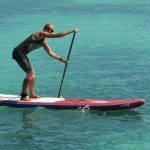 MAY: SUP Challenge Cologne, Surfing Main Freighter Waves, Podersdorf Surf Worldcup, The Ibiza-Spain Crossing, Mondsee sunrise paddle, St. Maxime Race and being robbed while asleep in the Campervan. May is when the road tripping got crazier. First, I drove to the Podersdorf Surf Worldcup. There was a highway closure due to a burning truck on A1 so it was standstill for almost 4 hours. Annabel Anderson kept me entertained by telling the story of the fabulous 96.5 km Ibiza-Spain Crossing she had just completed with Belar Diaz and Fred Bonnef. In Podersdorf I raced for the Tahoe Team with Maru, Michi, Christian and Mike. I got a Tahoe Bliss from Mike Schoch (makia.ch). It is one of the most gorgeous boards ever, I just love the girlie design with the flowers. I figured I owed it a proper maiden voyage, so on the way back from Podersdorf, I stopped at Mondsee where I spent the night to then go for a sunrise paddle in the morning. It was a totally amazing experience, the full story and pics are here. The next event in May was the German SUP Challenge in Cologne. I had in the mean time gotten my Fanatic Fly Race 12'6 and that was my first race on it. I finished 4th overall, 2nd on 12'6". On the way up to Cologne, Carsten and I stopped at my parents and went for a paddle on river Main, passing the church in which I was baptized (pictured below). The paddle got more exciting when some huge freight ships passed by and we were chasing their waves. End of May I then drove to the SUP Race CUP St. Maxime, my first ocean paddle at all, I had no clue what I was doing but it was a great way to spend my birthday there, especially as nobody knew it was my birthday (Carsten, Guido and Annabel with whom I wanted to celebrate my birthday there had pulled out of the race last minute). But the St. Tropez area is beautiful and there was at least one familiar face, Etienne, plus I met some great people at the race. The drive back was not so much fun as I was robbed while asleep in my campervan. The pics from the St. Maxime race are here. JUNE: Kochelsee paddle, Lago di Garda instead of Bergeggi, Lunar Eclipse over Wörthsee and the Hyeres Race. 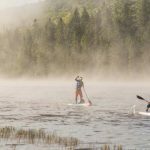 June began with an amazing foggy morning paddle on Kochelsee, with Michael Neumann vom Kanumagazin, for which I do the SUP-Pages. The pics of this paddle are here. From there I wanted to drive to the Bergeggi King of the Island Race near Genova, but my campervan's oil pressure line burst. My friend Robin from Munich drove all the way to Nogaredo and repaired it, but it was too late to drive down for the race (sorry Luigi! ), so we spent the weekend paddling on Lago di Garda instead. Another great experience in June was seeing the moon eclipse from a SUP while nightpaddling on Wörthsee, Bavaria. After the moon eclipse came the Hyeres Race, another drive down to South France via the windy Autostrada dei Fiori, a nightmare in my 2.55 meter high T3 campervan, the "molto vento" signs were flashing and I could not go faster than 50 or 60 km/h. The Ferraris and Maseratis passing me with like 200 km/h in the tunnels were also scary. I finally arrived in Hyeres around midnight and spent about an hour wandering around port de Hyeres trying to find the event site. I was so delighted when I finally spotted Luigi Reghitto's Adrelanina Sports Van. Dear event organizers, please give a navi-compatible street address for the race, thanks! Other than the missing address, the Hyeres Race was one of the nicest events this summer, the weather was great and I just loved the flair Alex created with the Hawaiian style dancers etc. Plus, I was finally reunited with Annabel again, after some catastrophes had prevented us from meeting in St. Maxime and Bergeggi. I also met Belar DIaz and Fred Bonnef there, with whom I would embark on more adventures later in the year. The Hyeres Race report is here and the pics are here. On the drive back from Hyeres my campervan hit the 333.333km mark, the drive dragged on forever, it was my 4th drive of autostrada dei fiori in a month and I started memorizing all the nice names of the tunnels. I was thinking I would marry a tunnel of Autostrada dei Fiori just to get a nice last name…. The July highlight was for sure the Venice race and the Canale Grande Paddle. Thanks to supinvenice.org for this great event! The race report is here and pictures are here. It was also the last trip with my beloved T3 California. I had some more great paddles in July, one was a full moon paddle on Lake Constance. Afterwards we had a huge bonfire and slept outside in our sleeping bags right by the water. Then there was the stormy Lake Ammersee paddel with Etienne. There was so much wind, there actually were small, surfable wind waves. In August we had some nice floodwater in the Munich rivers. So Carsten and I had some fun SUPsurfing in the River. We also tried out the new Imagine 16' adventure board, we went to a festival at Ammersee and watched the most amazing fireworks from our boards. The video is here. Then came a paddle on mystical Alatsee near Füssen, also dubbed the bleeding lake, this is a story I am still yet to publish. From there I headed to the French Atlantic Ocean for a week of Surfing. End of August there was the Starnberg Race. Ramon Blanco and Kimberly Crellin came over, we had a great time and all made it to the podium. The race report is here. After the race we went paddling on Walchensee, one of the most beautiful lakes in Bavaria. September started with myself, Guido and Andrea (Bavarian Waters) driving down to our house in Lenzerheide (1465m). The plan was to train on altitude before the Silvaplana Race, the hightest SUP Race in Europe. There we were joined by Belar Diaz, Vicotr Perez, Roman Frejo and Ruben Salvador – who had driven all the way from Spain. We headed to Silvaplana via Julier Pass the next morning where we were reunited with Luigi Reghetto and Meri Valentina Gaburri from Italy. The race was great, the weather terrible. Andrea, Belar, Roman, Luigi, Meri and I made it to the podium. The race report is here. We won some nice price money which we invested in a monster pizza, a spa session in beautiful Therme Alvaneu and the gas to Holland. Yes, Holland. We drove straight to Eleven City Race from there. Well, that was the SUP highlight of the year. Initially, I only wanted to paddle for a day and take pictures, but the weather forecast was terrible. 10 degrees, rain and strong wind for the whole week, so I thought standing around in the rain taking pics would be no fun and decided to paddle the whole race instead. I only had my Fanatic Fly Race 12'6 but got my hands on the 14' Flatwater Prototype last minute, thanks to Fanatic. Big Thanks also to Moritz Martin for cutting and bringing a Kia Loa paddle with a smaller blade to Holland for me last minute, too as my Shaka Pu was too big for the big proto. I thought 45km per day in easy flat water can't be worse than the 13km Riccione Race in crazy waves. How wrong I was. 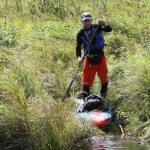 There was no easy, there was constant headwind and to make things worse a lot of the paddling was upstream as well. Long story short, I somehow finished (big thanks to Joelle Terrien, who helped me a lot) and it was a great experience. Belar told me during the race: "This is a race you will appreciate a few weeks from now, even if now you are thinking, what the hell am I doing?". How right he was. I learned so much in Holland. Mostly patience. Not one of my strong traits. But after Holland I spent hours and hours sanding my campervan to remove all the rust, something I think I would never have been able to do before. After the Holland Race I attended the SUP Clinic with Eric Terrien in Speyer. That was great, I benefited a lot and all the questions I had after the Holland race were answered. In October, there was the Chiemsee Race near Munich, in the worst conditions ever, 4 degrees, snow and up to 50 km/h of wind. The pics are here. The weather is not always this bad in October – we often have T-Shirt weather – but that weekend was just bad. Many racers, even among the top 10 men, started to paddle on their knees but after Holland – where I had paddled a lot on my knees – I had the ambition to paddle the whole race standing up. I thought 11km, that must be do-able after the 45km in Holland, but the last 3 km were really hard, I thought I was barely moving but I somehow finished, I think 5th. They did not punish the "knee-paddlers" which was kind of unfair, the girl who won had literally paddled into the finish on her knees, but I was proud to have finished standing up. After the cold Chiemsee Race I was desperate for some sun, so I went to Spain for the Spanish Championships in Somo, where I finished 5th. Thanks to Belar and Ramon for sorting a board for me and showing me the area. Aside from the race there also was a SUP surf competition, in which I did not participate, but I caught some nice waves on my surfboard instead. The swell actually was so good that I stayed much longer than planned, having to buy another flight home but that was totally worth it. Somo is a great place and I will for sure be back. Guess what? I did not travel in November, except 2 business trips to London where I paddled on the regent's canal. November 2011 was one of the sunniest, dryest ever in Munich. We had 148 hours of sunshine, Rome had 88, Madrid 46. London 33. I used the time to finish off the rust removal works on my campervan and had some nice sunny paddles on Bavarian Lakes like the Chiemsee paddle pictured above. Another highlight was paddling Eibsee in Boardshorts with Arnd Dünzinger. Eibsee, that is the beautiful mountain lake we had paddled with Annabel in November 2010, but at that time there was lots of snow, so we had gone for a snowy BBQ on one of the islands's lakes. That story is here. December wouldn't get boring either. Paddling in London on the canal, then the Paris race where I finished 7th (3rd on 12'6). I went there straight from London, big thanks to Arnd Dünzinger for taking the boards for me and Belar to Paris from Munich. The report from the Paris race is here and the pics are here. From Paris we went to Gibraltar / Tarifa for the Gibraltar – Ceuta Crossing. Thanks to Belar, Ramon, Kimberly and Fred for a great time there! 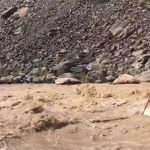 The full story of the crossing is here and the here is a video. Thanks to Fanatic and ION for the support and all the friends who were part of this and made that year so special! I am looking forward to 2012, the first events are online here. Cu on the water, whereever, whenever!